I think I outsmarted myself. You see, we’ve always sent out photos with the Christmas cards. When Tyo was a baby, I just bought the cheapest box of cards I could find. Then, I realized it would be nice to be able to fit the 5×7 photos inside the cards, instead of wrapping separately. So I bought the cheapest box of big cards. But if you’re going to send people cards in lieu of real presents (sorry, Grandma), eventually you start to think about quality. About… y’know… meaning. And then one year it occurred to me to try and take my own photos (I think that was the year Sears stopped giving great coupons for family sittings before Christmas). And once I was taking my own photos, well, I might as well mess with them in photoshop, throw in a few cheesy filters for good measure, and the next thing you know I’m trotting off to Michael’s, picking up a pack of blank cards, and spending far more time than it really ought to take to figure out how to format the damn things so the writing inside and the picture outside come out on the right ends, right ways up. And it’s served me well, the last several years. One year we had my two nieces in the picture as well. Usually it’s been both Tyo and Syo. But this year, apparently, something came loose in my brain. Because instead of just picking up another pack of ivory cards, I grabbed black ones. Which, of course, you can’t print on. 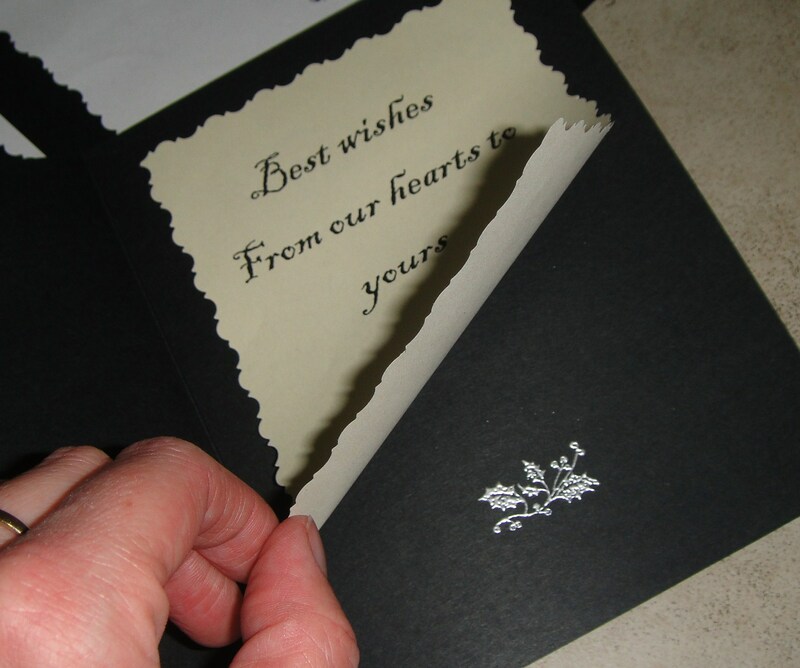 But you can print on other papers, cut them out (with fancy scissors), and paste them on! Perhaps a bit of backstory is in order here. My mother, bless her heart, is a serial crafter. (Sorry, Mom, you know it’s true.) She has probably dabbled in just about every hobby you can think of in the past forty years , from stained-glass to needlepoint to beaded jewelry to fabric-covered boxes to… well, stamping. Secret stamp in every card! Anyway. The stamping was quite the thing in the 90s, as I recall. There was even a whole stamping store in my hometown, which only happens when a fad is in full swing because it’s really not that big of a city (well, nowhere in Saskatchewan is). She made the most gorgeous home-made cards and even sold a few of them, with fancy papers, many coloured inks, and, of course, embossing powder. For those of you not in the crafty know, embossing powder works like this: you make a stamp, often with a special clear “glue” ink, then sprinkle the very fine embossing powder on it. It sticks to the stamp, falls away from everywhere else. Apply heat—we initially used the iron (no contact though) but she eventually acquired a special heat-gun-type tool for it—and the powder melts, fusing to the paper and forming shiny, raised lines. Anyway, as these things go, the fad passed, my mom’s interest moved on, and several Rubbermaid tubs full of stamping supplies languished in her basement, until last summer when I had the bright idea that I would see if I could liberate them. I was pretty sure Tyo and Syo would have a blast. So when we were home last summer I snagged the works—stamps, ink-pads, embossing powders, and even the weird heat-gun-thingy. They had a blast. I was fully expecting all the stamp pads to be thoroughly dry (they were last used when I was in high-school, after all), but most are in good working order. … and now I’ve covered the kitchen with stamps, scraps of paper, and a fine layer of silver embossing powder, yelled at the kids for smushing stamps every which way, and had better do some quick cleaning before bed or my husband may not speak to me again this year. If ever. In other news, Tyo is fast developing into an enabler. She talked me into buying these at Value Village today (in between hunting down knick-knacks to give to her friends. Knick-knacks at VV are sooo vastly overpriced. Anyway. Blaming them on her makes it all right, right? She said I should wear them to a Christmas party as part of a Mrs. Claus costume. Unfortunately, they’re too dark to match with the Lady Grey coat. I guess that means I need to watch out for a bright red pair, right? This is so funny. I had a post on this sort of thing last year titled “Holiday crafting OCD”. Maybe you find comfort in knowing I did the exact same thing as you this year. Hours on the photos? Check. Stickers and stamps and embossing (I used candle flames; only burnt a couple of edges). Check. Cardstock and printer paper and putting it all together. Ceck. Did I mention I made 30 and no card was allowed to be the same as the others? No wonder I haven’t sewn in weeks. 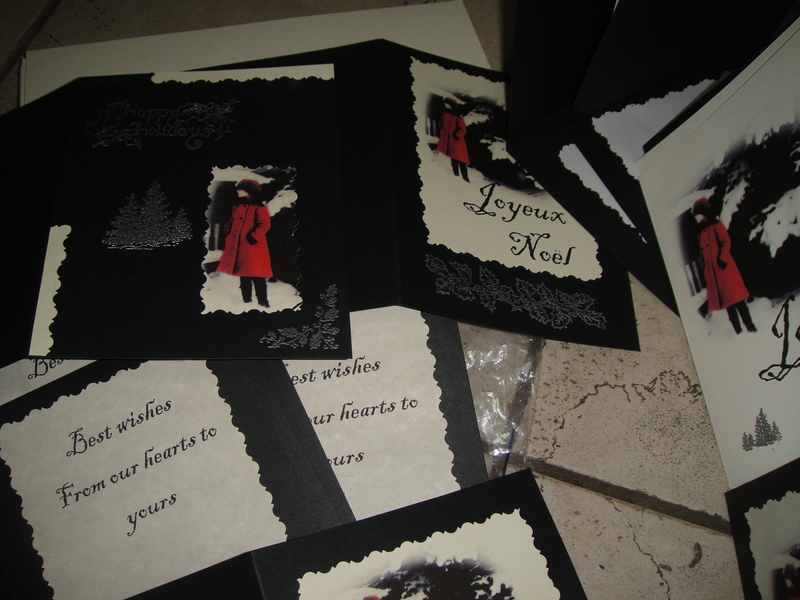 BTW, your cards look gorgeous, I love the black/white/red coat theme! LOL! At least I’m not alone. I’m aiming for about thirty, but they will not all be unique, at least. LMFO @ “(If glitter is the herpes of the craft world, surely embossing powder is the chlamydia. )” … does that make Mulled Wine the seasonal-appropriate penicillin to your ailing over-craft-worked fingers ;)? The red boots are very snazzy! Maybe a new black coat would match it well vs. buying a 2nd pair of brighter-red boots??? Those red boots are awesome!! Also, I happen to like scrapbooking a lot. Or paper-crafting in general. Since my back injury took away gardening or other hobbies that involve heavy lifting and lots of torque, I settled on sewing and scrapbooking. Those cards are looking awesome, btw! I’m so torn on the idea of scrapbooking. I tend to pooh-pooh it, I will admit. I’ve even been known to go on rants about “processed life” and how one should focus on enjoying what’s already happening. But I know, in my heart of hearts, that given infinite time and money, I would have a blast. Your daughter found those boots for you!!! What a little fashionista. They look great. Your cards are beautiful. One year I made a card of DD drawings and people kept talking about it all winter. Folks really do love receiving personalized cards. What a snag on the boots! only in sask. The VV closest to me would have been stripped of them in minutes. I think the weird heat gun for embossing resembles an article of female enjoyment. no? at least the only one i’ve seen. Well, I’m in Alberta now, and I will confirm that the VV here rarely has anything so great (and certainly never for more than 5 minutes). Fortunately it’s only a few blocks from my house so I can stalk it regularly, otherwise it would be a total write-off. re. the heat gun… er, it does. Of a rather S & M bent, but yes. Love, love, love those boots. So much that I want them too. And I think you should go for a grey coat. A nice, woolen grey coat. With some excellent, elegant longer leather gloves. And these boots. Gorgeous. And ofcourse, I agree with you, you need some bright red boots too. And any other colour you could think of. But that goes without saying, doesn’t it? I’m not even trying to send cards this year. I may change my mind, who knows. I admit to being the former serial crafter. I am happy to see the stamps being used (and look forward to a card). I am amazed at how much you can accomplish. Just be aware that as you get older, there are NOT as many hours in the day, or days in the week! (I don’t know how it happens.) I did dust off my crochet hooks, and did a lampshade cover for a VV ‘leather-look’ (read plastic) shade for a 1920’s lamp which I bought for $5.00 and rewired (another of my varied talents). After 2 1/2 months of doing 3 rows and unravelling 2, I finally have it done (fitting a shade with a curved, expanding base was ‘interesting’). Now I need to press it. It actually looks pretty good, kinda like a spiderweb w/ leaves caught it it. Being the child of a serial crafter was pretty great—I got to try a little bit of nearly everything. I find I try to keep a really tight lid on the hobbies I explore *because* I have a limited amount of time (not to mention money!) and I feel bad for my kids because of it. OH and i decided to go the feathery route and make a faux fur capelet (?!) because i’m apparently also smoking the craft crack! So funny! I have a box of stamping supplies from my serial crafting mother too. 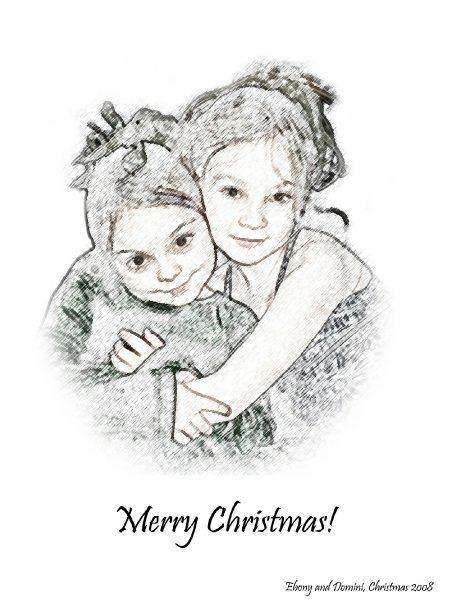 Yesterday my younger children made Christmas cards all day whilst they were in at work with me. I am not sure if embossing powder and glitter all over work is better or worse than all over the house. Your boots are gorgeous, but the cards are even better. Your cards look very swanky, nice job! Those boots have enough built-in attitude that you can probably wear them with anything! In these parts the tradition is not Christmas cards, but New Year’s Day postcards. Does this buy me extra time? ha ha ha I’m usually still stamping, stickering and cursing my poor Japanese calligraphy skills on the 30th. I “liberated” my mom’s embossing gun too. It’s great for stripping paint and softening window putty to remove broken glass if you’re a female with small hands and can’t hold onto the big heat gun from the hardware store. I was also raised in a craft-friendly household, and have my own stash of many crafts to prove it (the large tub of different colored grouts for mosaics weighs on me, but I’m not quite sure I’m done with the hobby–it’s fun). The boots are fantastic! There is nothing like a pair of hot boots. I am impressed with anyone who wears heels. I just can’t abide the pain for even a few minutes. I always ogle the mosaic tiles at the craft store… I was so excited when I got to incorporate little circular mirrors from the mosaic section in some costuming. Not likely to happen for everyday wear, though. 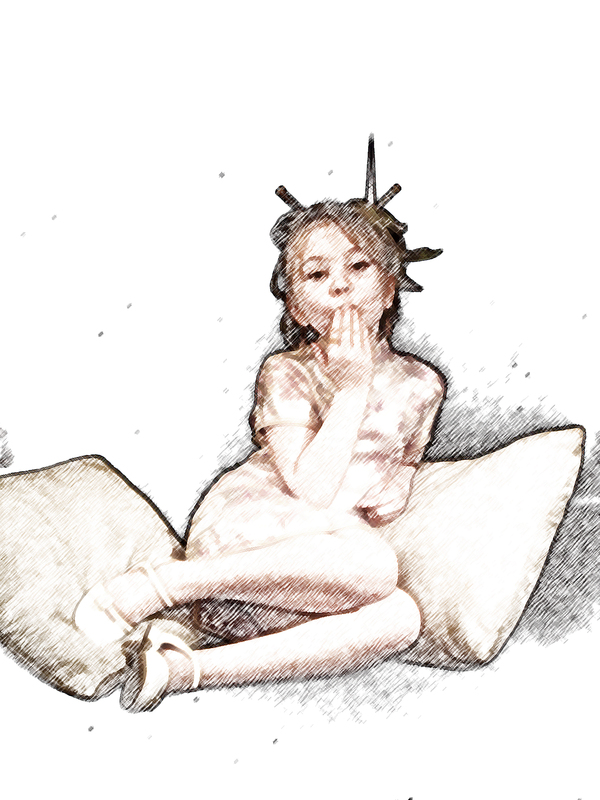 I am not a big heels-wearer, either, and certainly not stilettos. Another reason these boots were not a sane purchase. But they are fun.. gawd they are fun. Great-looking cards! I love that you picked the red coat in the snow photos, they’re so pretty! oooo….. so behind on blog reading! AND christmas carding, which I normally do the weekend after thanksgiving! I delved into all sorts of crafty things getting ready for the wedding – including quite a few scrapbooking shops while making our invitations. I felt compelled to tell EVERYONE that while I was buying scrapbooking supplies, I was not, in fact, a scrapbooker. I love the scrapbook stuff, I think it’s the books that go along with it that drive me buggy – you know, the ones that have scrapbook page ideas? I suppose it’s not different than following a pattern, but there’s something about it that makes me feel like it’s already done already! I JUST got going on our cards today and as such, we’ll be doing new year’s cards. I wasn’t sure if we wanted to go with printed wedding photos for cards and we finally decided on a mix. printed photo cards with scrapbooky ‘inserts’ that we can write on. Both the boy and I like the personal note part of cards the best! I LOVE your cards, and loved those pictures the first time around! And the boots, of course, are to die for!